VAT For Amazon Sellers WARNING – Pan-European Fulfilment TRAP! I’ve written about VAT a number of times on this blog, and with good reason – it’s a topic that causes a lot of confusion for online sellers and if you get it wrong it can really destroy your business. In my opinion, registering for VAT when you don’t need to is the biggest tax mistake an eBay or Amazon seller can make! But all that has been covered before on my blog, numerous times in fact, so what’s the point of today’s article? Well today’s post is really a warning about Amazon’s Pan-European fulfilment service – which is a HUGE tax trap under new EU law. But Amazon have gone one step further and recently a very exciting addition to the Fulfiled by Amazon fulfilment service was introduced, called Pan-European FBA. The idea behind it is very simple – it allows you to offer your products to all 5 European marketplaces but rather than your stock being stored and shipped from one fulfilment center (as is normally the case) – Amazon will distribute them across ALL 5 countries. Amazon don’t charge you to distribute your stock and you don’t even have to do it yourself. You simple send your FBA items to your local Amazon fulfilment center and Amazon then spreads it around all 5 countries (plus two more) based on expected demand. Having your stock stored in the home country makes it eligible for Amazon’s sales boosting Prime delivery service in all 5 European marketplaces, meaning you’ll see a big boost in international sales. It obviously goes without saying that shipping domestically is going to be faster than having all orders sent out internationally from one Amazon fulfilment center. Faster deliveries means happier customers and more repeat orders. Yep, you read that right! Even with all the added benefits, Amazon’s Pan-European fulfilment actually saves you money! How? Well because you only pay the local fulfilment fee for that particular marketplace when one of your items is sold and you save the usual cross border fee charged when you sell via Amazon’s European Fulfilment Network (EFN). So as you can see, you save between 13-38% in Amazon fulfilment fees, depending on which country you sell to, which is a significant amount and nothing to be sniffed at. I’m guessing you’re now wondering what the problem with Pan-European FBA is? After all, it’s free, it will increase your sales, and it actually saves you money in fees…! It means you have to become VAT registered in every country that your stock is stored in! This is due to the EU law introduced last year to try and tackle overseas sellers who store stock in Europe, allowing them to undercut local sellers WITHOUT having to pay the same taxes. Following this new rule, you now have to register for VAT as soon as you have inventory stored in a country. So if you have stock stored in Amazon’s fulfilment center in Germany, you need to register for VAT in Germany. If you have stock stored in Amazon’s fulfilment center in Italy, you need to register for VAT in Italy, etc. etc. What this basically means is that you’ll have to register for VAT in every single country that Amazon stores your stock in, which also includes Poland and the Czech Republic (as well as the 4 European marketplaces). And no – it doesn’t matter how much you’re selling. This is different to local VAT registration, where you only have to register once you reach the sales threshold (this is currently £83,000 in the UK but it’s generally increased every year). As soon as you have stock stored in a European country, you need to register for VAT in that country (even if your sales are £0). In comparison, when you store and ship products from a sole Amazon fulfilment center, we’ll use the UK for this example, then you only need to register for VAT in the European countries that you sell to once you reach their distance selling thresholds. Now these differ from country to country but generally it’s €35,000 (roughly £30,000) with the exception of a few countries (Germany, Netherlands, Luxembourg) where it’s €100,000 (roughly £85,000). Just so there’s no confusion – using Amazon’s Pan-European fulfilment service means registering for VAT in 6 different countries. You’ll have to charge the correct VAT rates to the correct customers, keep records and file VAT tax returns for all of them as well. People find it too much cost and work to do this for one country, never mind 6! I shudder just thinking of all that paperwork – and the cost is going to be huge as well as you’ll most likely need to hire a local accountant to take care of all the country specific details. Realising how this is going to put off the majority of sellers, Amazon have teamed up with KPMG (one of the “big four” auditors with a revenue of $25 billion a year) to offer a special, discounted rate VAT service for Amazon marketplace sellers. KPMG are offering Amazon sellers VAT registrations and filings in up to 7 EU countries at special bundle and discounted rates. Now this may seem like a lot of money, and well… IT IS! But that’s because you’re registering and filing VAT returns in 6 different countries – so it’s actually not an unreasonable fee to charge. And to me it’s a perfect measuring point – unless you’re happy to pay £3600 for the privilege, then you should simply continue selling to Europe from Amazon’s UK fulfilment center. After all, how much do you need to be selling to make that worthwhile? We discussed earlier how you save 13-38% in Amazon fees by using this service, so let’s call that 25%. That means to save the £3600 yearly fee you need to be paying £15,000 in Amazon seller fees per year (and that’s just talking about your fees for sales to European countries). I know that’s a very simplified way of looking at this and it ignores the other benefits, but I just wanted to illustrate how this should only be considered if you’ve got the sales numbers to back it up. All in all, I can’t see how this is beneficial at all and I hope you see why I called this a VAT trap – really nightmare is a more accurate term. If you’ve fallen for the Amazon sales talk and signed up for this Pan-European fulfilment, then I’d love to hear from you in the comments section below. Has it made a huge difference to your sales and how are you handling all the tax requirements? Great info! I am selling on Amazon DE (FBA) and I am registered for VAT in DE. I noticed that when a customer from another EU country buys my product, Amazon calculates a different VAT percentage. For Germany it is 19% en for customers in the Netherlands they use the 21%. I am a little confused; do I pay the taxes for that sale in the Netherlands in Germany? And if yes, do i pay this 21% to the German Tax Authorities or the 19% rate? It depends on who the customer is (VAT payer or no) as well as whatever they buy directly from you on Amazon OR Amazon buys the item from you and then sells it on (you will see these transactions in the monthly Global listings invoice). Also – make sure that you have enabled VAT calculation services in your account and you have provided valid VAT number there so that Amazon knows your VAT status. With all things being equal, if someone buys from you and is NOT VAT registered – whatever it is from Germany or Netherlands, the VAT rate should stay the same – 19% one that is German rate and that’s where you pay the VAT. In your example, something else is going on and that’s why there’s that difference. This is probably going to sound silly, but if I am selling from the UK using FBA, do I not have to pay taxes in the EU countries or is it just VAT once you hit the threshold? Lowest I believe is France at 35000euros, like here in the UK you have to sign up for tax if you earn i think £2000 or more working, do I not have to do this for every EU country? (exclude Germany) Will it just reflect in my end of year tax return for UK? No, you won’t have to pay income/corporate taxes in those EU countries. All you pay is VAT (when you reach distance selling threshold OR if you send goods to store in those countries using the Pan-EU program). This is really useful, thank you! I wonder if you can help with my query. We are based in the UK and not VAT registered as we are under threshold. We use Amazon FBA to supply UK only at the moment. My question is – if we copy our listings to Amazon.fr or Amazon.de (or the other European marketplaces) but don’t select pan-european FBA – would this mean Amazon would supply these European customers from the UK warehouse? Would we then need to register for VAT in those countries? To sell in Germany, you basically have to register for VAT – at least that’s how Amazon interprets the new German law right now, even if you don’t send physical goods to Germany. I am selling on Amazon Germany Marketplace from past 3 years. I am sending my products from India to Germany. I am not doing Amazon FBA in Germany, still I have received the notice from Amazon to get the German VAT id. I would like to know in the above case, do I need to register for German VAT certificate? Will Germany tax authority ask me to pay previous 3 years taxes also? Yes, as far as I know, this means you will need to register for VAT number in Germany. At least that’s how it looks right now from the info I can gather. As for previous 3 years – IF your sales to Germany were LESS than 100 000 EUR per year, then no – you won’t have to pay anything for previous years as you were under the threshold of VAT registration in Germany. Thank you for the great article, I am really sorry if this has already been asked but I am interested in opening and selling from Amazon in USA. I live in the UK so how exactly does the tax work? Do I also need to register with HMRC for VAT and tax? Yes, you need to register in the US for sales tax IF you plan on using FBA. Not sure on the UK VAT thing – I think you will have to do that, yes, as you’re exporting goods outside the EU but you need to consult an accountant to clarify this. I am planning to start selling on Amazon. I have company registered in France and I am not registered for VAT until I will reach €35.000. I would like to be focused only on French and Czech market and shipping from France by FBA. In this case is it possible to apply just for 2 markets and not European Pan and register for VAT once I will reach the limit on each country limits, do I understand it right ? All this VAT thing is very confusing and seems like a headache to be register for PAN and deal about VAT with each country. Have a great day and thanks for your article. Yes, you can do that! You can use selected Amazon marketplaces and send stock there and only register for VAT in those selected countries. I’m not EU resident and are currently selling in Amazon.es. I am already VAT registered there and want to expand to Germany. At the moment Amazon charges me about 11 when I sell a product to Germany for 17 and is fulfillled from Spain. I’m considering paneuropean program to save on this high charges. I am prepared to register for vat in Germany, is there anything that I’m not considering here? Is there a better move for me at this point? This way you still have to register for VAT in Germany BUT won’t have to register in France, Italy and UK. Do you know if the amazon VAT service will automatically send the correct VAT data to the appropriate fiscal administration or do I need to enter data provided by amazon manually in every juridiction every month? In this second case, the language barrier may be too difficult. Amazon won’t send any data to local tax offices, no. This might be a thicko question but here goes……. I am NOT VAT registered and have been selling on Amazon FBA now for coming up to 12 months. I only have sales of £7k for the year (it’s a hobby) but I am really confused about VAT. I receive my money every 2 weeks but do I have to pay VAT to the government on the these sales I have completed. I import items from China and pay full import and VAT on their arrival. Where are you located? In the UK? If so, you don’t have to register for VAT and don’t have to worry about it. Hi My Name is Mudit & I am From India.. I have sent an Inventory to FBA in UK 5 days Back which is now closed But the inventory is in Reserve since last 2 Days. When I see the listing like a Customer it shows me “In stock on August 30, 2018.” but I can still Order. As I have already Recieved 1 which is in Pending State. 1. Now do I Need Mandatory VAT Registration in UK For this..? 2. Also I Recieved a Mail From AMAZON UK That You “MAY BE” required to register for VAT, but they haven’t Mailed Me About you have to mandatory do registration. 3. Also I Have Read Somewhere if I Dont get registration done they will temporarily suspend my account, until I upload valid VAT Doc. 4. And What if I Dont want all these hassle, can I just remove my inventory and sell as a normal seller fulfilled even though I have recieved 1 order in FBA Already(Pending State). Please Reply Need an Urgent Understanding. thanks for Your Wonderful Article. 1) Yes, as you’re storing goods in the UK, you have to register for VAT in the UK. 2) You have to register for VAT, as goods are stored in the UK. 4) Yes, you can do that. But shipping from India won’t work that well for you…. Please Make Me clear if I Remove the Inventory from the UK after completing Pending Orders in the FBA, would I be able to be clear from all these VAT Issues..
Also I cannot Remove my inventory from FBA till 26th as she said(UK Customer Support) that they are shifting there FBA center due to which it will not be available for Removal for next 10 days or so..
Also I am Afraid till then I will clear my inventory in sales only coz I have sent a very little inventory for a test like around 34 Items out of which 3 are already sold..
What would be the consequences please in every situation. Sir I am based in India and I do not use FBA, I ship my orders myself to buyers directly from India, if I ship directly from India to the buyer in UK on the orders received on Amazon.uk then do I need to get a UK VAT number. In this case will I be able to complete my seller registration and start selling on Amazon.uk without VAT number. No, in this case you don’t need VAT number when you’re just starting out, as you’re NOT storing goods in the UK. You will only need to register for VAT in the UK when your sales to the UK reach distance selling threshold. Do you have any source for this EU law? Did some searching but cant find it, thanks! I can’t recall the exact name for it, sorry. How will we know- to which stock locations within the Pan European Programme Amazon is sending our products, so we can do the correct filing for VAT. My understanding we send deliver to AMAZON UK stock locaction and they distribute within the 7 countries. I have not used PEP myself yet but as I understand you can get this data from the inventory reports (just like now you can see in which UK warehouses and how many units of stock you have). But maybe there are more advanced tools available when you join the program. Yes, they do have to register for VAT in the UK from DAY ONE, if they will use FBA in the UK for their business. Our business are looking into signing up with KPMG for our Pan EU FBA. We are a limited company with an existing VAT Number, and was just wondering which package offered by KPMG would be the most suitable for us. The package of registration within 6 countries seems to make sense as we are already VAT Registered within the UK, however this mentions its for EU Based sellers and wasn’t sure how our status would change after we leave the EU. 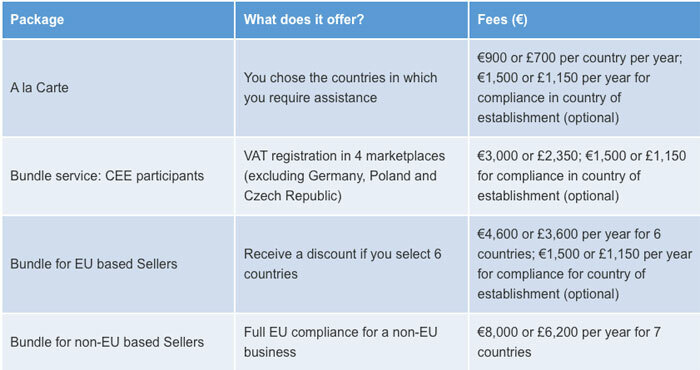 In this case do you think it might be better to select registration for 7 countries for ‘non-EU Based Sellers’? With questions like these you really should contact KPMG and get answers from them. Sorry, I haven’t used their services so can’t give any feedback or further advice on these services. I am a US based company selling Books – only books (small publisher) in the UK/EU on Amazon’s FBA. We have our hardback books printed in UK and stored in FBA Amazon warehouses for fulfillment to UK & EU customers. We also import from the US our paperback books, store them at FBA Amazon warehouses in UK and EU to be shipped to customers. 50% of these books we have stored at FBA Amazon are books we give as gifts to our customers, for subscribing to our financial services. FBA Amazon acts as our dropship type fulfilment center – gets our books to the customers faster and is cheaper then shipping it to the customer from the US. #1 Do we have to register for VAT? I read somewhere that books were zero rate?? #2 Do we have to pay VAT on books we have made in the UK? #3 Do we pay VAT only on the books we import and store in UK? #4 What would our VAT be based on if books we send from UK warehouses to a to UK customers are free? Would they base the VAT on the value of printing these books? Thanks in advance, just trying to sort out this VAT tax, its not too straight forward. Yes, printed books in the UK are ZERO VAT rated. But it doesn’t mean you don’t have to register for VAT – as far as I know, you still have to register for VAT and do VAT returns etc., you just don’t charge any actual VAT on your sales and apply 0% VAT rate. And you do need to register for VAT in all other EU countries your books are stored in PLUS in those other countries it could be that books are NOT ZERO VAT rated, so you will have to charge normal VAT on those sales. All in all your situation is specific/complex and you should seek professional accountant’s help to help you sort this out in a way that is most beneficial to your company. If you could help, I’m slightly confused regarding vat thresholds in eu states. So if a UK VAT registered company sells directly to consumers within the e.u from the UK, and if sales in each e.u state are under their relevant thresholds, would you charge VAT on your product to those e.u customers ? Even if your UK sales are are exceeding the £83,000 threshold and you are paying (and charging) VAT in and for UK sales. Thanks in advance I know you get barraged with questions. Yes, in that case you would charge VAT (UK VAT) on sales to those EU customers. 1) When you sell/export outside the EU. 2) When you sell to a VAT registered person/company in the EU and they have provided you with a valid VAT number. This is a really helpful discussion concerning VAT. My question relates to the VAT thresholds for each EU country. In the UK, the £83k+ threshold is based on total overall income whether that comes from any other country into the UK. But in the other EU states, are you saying that you don’t need to register for VAT until sales from each of those countries reach each respective threshold? I think I will be doing a detailed post on VAT in next 2-3 weeks on my blog as so many people are still confused about this. So please stay tuned for that – I can’t really explain it all in a comment reply here. thank you for great article. We start selling a year ago and I singed in for PAN-EU and of course I was not aware of this VAT trap. However, our turnover is around 300k€ on German Amazon, which means we pay around 75k on Amazon fees. After reading what you are mentioned, it looks we may saved good money on Amazon Fees and therefore PAN-Eu is good for us in terms of fees, what do you think? I’m currently trying to deal with the VAT registration since we did not have them in all 7 EU only in Czech Republic and Germany. And it looks like a nightmare also financially. One Tax consultant specializing for Amazon asked me for 18K for the VAT registration in all the markets. So to be honest, I am quite happy after reading you can hire KPMG to do it for just £3600, that’ really great news. My question is: I have pay VAT from those 300k to German government. I assume Amazon pays also VAT from those 75K which gets form us, right? Can I lower my VAT returns to Germany by those 75k paid by Amazon? So instead of paying VAT from 300k I would pay VAT only from 225K? I hope I explain my self in the way you can understand that. I’m sorry but I am not really in a position to give advice on VAT as it’s a VERY complex and detailed topic, especially if multiple countries are involved. You do need to speak with a tax/VAT consultant about this. Worth noting that Amazon is increasing FBA fees from April 26. The difference in shipping from UK to EU vs. locally is significant e.g. £2.57 per unit for our small parcel. I have a VAT registration because I used to sell on Amazon FBA in UK couple years ago, I do not sell on Amazon UK for the last 2 years. I still have VAT registration and filing 0 returns. I sell only on Amazon US through FBA program. Amazon has export program and will ship my items to customers in UK if I sign up for export program. (this is not global selling, just an export option). Do I need to charge VAT for goods shipped to UK if I use Amazon export program in US? My goods are in US only. Yes, you will need to charge VAT on such UK sales if stock is moved to the UK warehouse. Thank you for your reply. My stock is never moved to UK warehouse. It ships from US directly to customers in UK and Amazon is charging for import duties. Do I need to charge VAT? In that case – no. I realise this is a little bit old but if he’s still VAT registered in the UK then I’m relatively sure that he would have to charge VAT on any UK sales. This is completely inaccurate. You do not need to register for VAT in every country you have stock in. You need to register for VAT when your threshold of sales reaches that of the country that you are selling in before registration. For example in Germany, it’s when you sell €17,500 per year. €82,000 in France, Italy €60,000 all this information is quite easily available online, I don’t know why you are telling people they all have to be VAT registered in every EU country they sell in. I’m sorry, you’re not right. You DO have to register in every EU country you have stock in, from day one. So if you use European Amazon warehouses and send stock to those countries, you have to register in those countries for VAT from day one. IF you don’t send stock to those countries but simply sell over distance, from your location/warehouse, then you DON’T have to register for VAT in those countries until you reach those distance selling thresholds you’re mentioning. I know this is 100% accurate information. Could you please refer me to a link to that law? I’m already VAT registered for all 5 main countries for Amazon Europe because I already reached all sales thresholds, but I’m thinking on using Poland and Czech Republic as Germany’s secondary warehouses and I want to be very sure I need to register on both countries too, so I would really appreciate direct and clean information about it. Also, it sounds strange that just 2 weeks ago Amazon published a note in Seller central regarding the need of registering in UK due to the new position of this country in the EU, but just UK. So Amazon would be suggesting that there is no need to do the same for Spain, Germany, France or Italy. I can assure you that it is correct information and yes, you do need to register in Poland and Czech Republic too, if you plan on using FBA there. As for Amazon now pushing the UK VAT registrations – it’s LONG DUE!!! HMRC has been in talks with Amazon for a long time now and finally they have come to agreement that Amazon will actually undertake the VAT registration number vetting part and sort this mess out. It’s NOT a new law or rule!!! This has been in law for years now, just not many sellers are following it. Amazon will now police this in the UK and most likely in the EU too very shortly. Thanks for the article. I am a sole trader, only selling in UK, using Professional seller account and not registered for VAT as not doing level of business to the £83k threshold. But I am being charged VAT on FBA, seller and product ad fees – should I be? If yes, then surely there is are advantages of being VAT registered for people just starting out as they would be able to claim the VAT back on these? Haven’t done the maths yet when factoring the VAT returns on sales to HMRC. No, there’s no advantage of being VAT registered in your position – yes, you won’t pay VAT on Amazon fees BUT you will have to charge VAT on your items – basically this means increasing your prices by 20% or taking smaller profits (in simplified words). So do not register for VAT if you sell only in the UK until you reach the threshold. Thanks for the reply Andrew – that is what I thought but Amazon’s VAT knowledge centre page says Businesses need to register even if goods are stored in the UK? Also import VAT paid at the time goods are imported into the EU can also be claimed back? Does this change anything / make being registered more viable? No, it does not change it – you would STILL be paying more in taxes/loses out, compared to situation when you’re not VAT registered. There’s AND after first 2 points. So you need to register for VAT in the UK, if you’re based in the UK ONLY if all 3 THINGS matches. Many thanks Andrew! Very helpful. Realistically, you only have to account for an additional 20% on what would be your profit margin, you don’t have to increase your selling price by 20%. Still sound advice not registering before necessary and you can claim VAT back for a period before registration, can’t remember how long but we had a nice cheque from them when we registered. Congrats for your very informative article! I’m wondering about the opposite though. Is there a way to avoid paying VAT on Amazon Europe? Can you please give me your views on the following scenarios? 1. A UK company registers on Amazon UK and sells (no FBA) there. Does it have a 85,000 VAT exemption? 2. A USA company registers on Amazon UK and sells (no FBA) there. Does it have a 85,000 VAT exemption? 3. A German company registers on Amazon Germany and sells (no FBA) there. Does it have a 100,000 VAT exemption? 4. A USA company registers on Amazon Germany and sells (no FBA) in Germany and UK. Does it have a German 100,000 VAT exemption or a UK 85,000 VAT exemption? If you don’t use FBA and don’t send physical stock to those countries, you don’t have to register for VAT in those countries UNTIL you hit those distance selling thresholds. The Pan-European program is all about moving stock to various locations in Europe which instantly requires VAT registration from day one in those countries where stock will be held. The selling price is 22,68 € the fee is 5,76 € (3,40 € referral fee + 2,36 € fulfilment fees). 22,68 €-5,76 €= 16,92 € so the vat to be paid is 2,70 €. Also when amazon sales a product clearly writes inclusive of German Vat but when an fba seller sales the same product it says nothing about Vat. I am a little confused on how to calculate the vat because after paying the vat and the amazon fees there is no profit for the seller except there are using other ways to avoid paying the vat and maybe their price is without Vat. The VAT is calculated on the item’s price – it has nothing to do with Amazon fees. So the VAT is calculated on the whole 22.68 € in your example. As for Amazon showing VAT and FBA sellers not – if FBA seller is NOT VAT registered, then no VAT will be shown on invoice. Only VAT registered sellers will charge VAT and show that in invoices. Amazon is obviously VAT registered so they will show VAT on all invoices. You say “Also, don’t forget that you can sell on regional sites and fulfil orders from Amazon UK too, without registering for VAT etc. in those other countries.” We currently sell on Amazon.com and Amazon.co.uk. How do we expand to the regional sites and fulfill from Amazon UK? It is not obvious to me. It is called European Fulfilment Network (EFN) and with this you can set-up listings on regional Amazon sites but use Amazon UK FBA for fulfilling orders. Please read more about how it works on Amazon’s help pages. I’m an USA seller that was selling goods on Amazon UK. Amazon forced me to register for U.K. VAT, which I did then HMRC states to contact me to pay for VAT back tax. The amount asking is more than the profit I made and more than what I can afford. I have stop all sales into the U.K. now, but what will happen if I Ignord their paymenr request? Yes, it could be that you owe more VAT than you have made profit, especially if you spent aggressively on paid ads. This is why you always need to monitor your sales and VAT amounts so you don’t get a big surprise after 3 months when you need to do your VAT return. I wouldn’t recommend you ignoring that payment request from HMRC as it can get you in serious trouble. Communicate with HMRC and try to set-up a payment plan or something so you can pay it off in instalments. As there is no Amazon marketplace in Poland or the Czech Republic, and assuming no sales are made in those countires by any other means, would the returns made in Poland and the Czech Republic be nil returns? My assumption is that this would be the case, and that the only reporting required would be sales on the relevant countries VAT return as and when sales are made. I have received advice from a Czech agent that I am not sure about: “the VAT returns would not be zero but the company must declare transfers between the FBA warehouses and the distance sales to other EU states (even if these sales were taxable in other EU states)”. Sorry, why do you need to do VAT returns in Poland and theCzech Republic? You won’t be storing goods there, so you don’t need to register for VAT there. You would only need to register for VAT in those countries IF your sales to those countries EXCEEDS their local VAT registration threshold. We will be registering for PAN FBA. As inventory will be stored in fulfilment centres in Czech and Poland, we will be required to register for Vat in those countries. The distance selling rules will no longer apply. Do you know how we must report inventory movements on our UK return? And if sales are made in an EU country, where the inventory is used from a fulfilment centre in say Poland… would the sale be recorded on a Polish vat return? In that case, yes, you need to register for VAT in countries inventory be stored. Thank you for the great article Andrew. I myself am looking at registering for VAT in Germany and France as these are two of my biggest markets outside of the UK and being Prime eligible in these countries would only be beneficial to my sales. I received this link recently: http://go.amazonsellerservices.com/Pan-EU-VAT-Promotion-October2017-EN-AS?ld=NSGoogle . “We are excited to offer you our current VAT services promotion. I was wondering what your thoughts are regarding this as they are making it very attractive to go through their Pan European program. I was also wondering if it possible to choose which of these markets I sell in to keep control of it. No, with Amazon’s Pan-European FBA Programme you can’t pick which countries it will apply to – you automatically get enrolled in all 5 EU Marketplaces. As for the VAT calculation service – from what I have seen, it is the best/cheapest option available for Amazon sellers but don’t really know how good the actual service is as I haven’t used it. Is it the same situation if you send stock to US fulfilment centres from the UK. Do I need to register for American VAT etc or is there a threshold in place? No, there’s no VAT in the USA but there’s Sales Tax. It is a very complex topic I will cover in future in a separate blog post. Thanks for the great article, as usual an useful insight of online selling. With reference to Amazon and how VAT is being charged, I’m now very confused. I’m watching Jungle Scout sessions on how to set up an Amazon business in Europe. In their 6th session they covered VAT etc.. But they stated that it is compulsory to register for VAT in UK if you are storing your goods in an Amazon warehouse in UK, regardless of the turnover/threshold. In your previous posts you advised to wait to register for VAT until a seller reaches the threshold… Has this changed recently? In my post/advice on NOT to register for VAT – I was targeting people who live in the UK – they DO NOT have to register for VAT for Amazon business either, for stock they hold in Amazon UK warehouse. For anyone outside UK, if they want to use Amazon FBA UK – they have to register for VAT from day one. Hope this explains it and let me know if you have any further questions. I have a business on Amazon and use FBA warehouses in UK. I am registered as a self employed here in UK but i haven’t registered for VAT yet. Still below the VAT threshold in UK. Do i need to register for VAT if i store my inventory in the UK as long as i live and have a company in UK? No, if you’re based in the Uk and store your goods in the UK, you don’t have to register for VAT IF you’re below threshold. I am selling on the Amzon UK and the other 4 EU Amazon marketplaces. The IT and ES thresholds are 35,000 Euros Net of VAT but I am well below that. The DE threshold is 100,000 Euros Net of VAT and I am well below that too. However my French sales will be around 40,000 Euros by the end of this year, 2017. So I need to Register with the French Tax authorities. A pain no doubt, but would Amazon then move some of my UK stored stock to France so that French buyers could enjoy Amazon Prime or would Amazon only allow stock to be stored outside the UK if you register for VAT in all European Amazon Marketplaces? I don’t know to be honest – I haven’t expanded to PAN-Europe program myself as right now concentrating on the UK and USA markets. They probably could do that, it would make sense but I have no personal experience with this. It is possible and easy. now your inventory will be stored in those 2 countries. You can also send inventory to France now. Yes, but you do need to register for VAT in each country your inventory is being stored. Any tips for a newbie looking to start selling on Amazon and finding a product to sell on Amazon? I will be doing a post about Amazon product research next month, so stay tuned for that. First off thank you for your amazing blog. I recently found out about it and it has been extremely informative and helpful in my new journey. I am new to Amazon FBA, around a month, UK based, intending to sell into the US market. I’m close to getting my first product shipped from China to the US. It’s a small test order of around 100 units. I’m dipping my toe in slow so to speak. Last night I registered as a professional seller but instead of being billed the $39.99 subscription fee, I was billed $47.99. I’ve combed through your website and failed to find anything on the topic. Google surprisingly only yielded a bit of information. But apparently the extra $8 is 20% EU VAT tax. According to an Amazon forum post, if you live in the EU, Amazon.com will charge you VAT on their services INCLUDING fba fees. This has come as somewhat of a shock to me, as it would wipe out a large chunk of my margin. I thought i was thorough in my research, but turns out i wasn’t. Before being allowed to become a professional seller, i had to fill out a “Tax Interview”. It was very short. I stated I am an individual not a business, a UK citizen living in London. Do you have any advise or information on the topic? Is this the correct process or am I missing something? Why do I have to pay VAT on physical goods that never enter the EU? I personally don’t sell on Amazon USA so don’t know all the small details but yes, they do charge VAT on your pro seller subscription fee. This is required by law and is done for any digital product/service. Not sure about the FBA fees though – you should contact Amazon’s customer service and find out whatever FBA fees will be VAT applicable or not. If they’re, I would recommend that you register for VAT, to claim back VAT you pay on these expenses. As your goods will be exported outside of the EU, you won’t have to charge VAT on your selling prices and will be able to get back ALL of the VAT you pay to Amazon via HMRC (when you do your VAT returns). 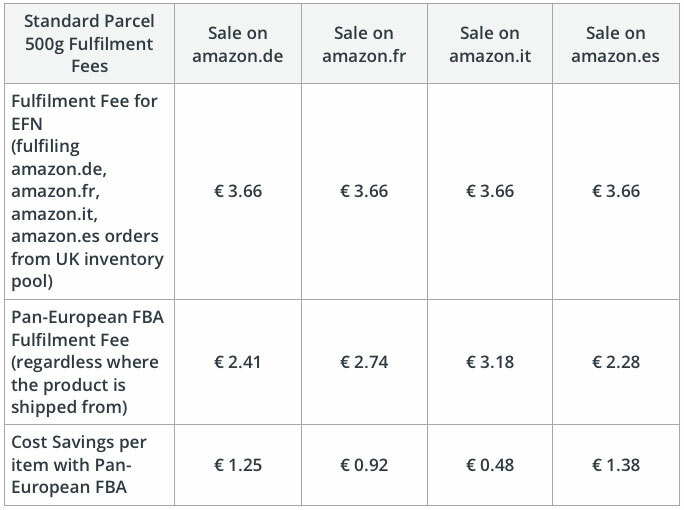 I believe Amazon head quarter is in Europe which is why the VAT is added to FBA fees even if you sell in US. Amazon does not issue VAT for these fees but you will see their own VAT number on seller central document or FBA fee statement. For this reason as far as I am aware you can’t claim back the VAT. However if you register for VAT and provide this number to Amazon, future VAT added to FBA fees or subscription will not be added. So how do you sell in other European countries by keeping your stock in a UK fulfillment center? I thought that as soon as one wants to sell out of the UK, Amazon would automatically move part of the inventory out of the UK too in order to be local to their customers. Is there a way to sell in other European marketplaces by keeping the inventory in the UK (and so no need to be VAT registered!) ? No, you don’t have to use Pan-European fulfilment if you don’t want to! You can still sell on European Amazon sites AND fulfil orders from UK warehouse. I am from CZ republic. I am a seller on FBA Amazon, and I was required to register for UK VAT as my 2 pairs of socks ended on Swansea Amazon storage on June 2018, unfortunately I didn’t know about this return from customer. So I sent for UK VAT but already 2 weeks no replies. Left only 1 week to sort it, after my FBA account will be closed. I’m sorry but I won’t be able to help you with this one – you need to communicate with Amazon support and sort this out. Hi Andrew, yes I signed up to pan Europe programme and did have a boost in sales but then realised about all the other tax implications and de registered. Unless you are selling huge amounts, it’s not worth the extra head ache. I just up my prices to cover the extra fees when sending from my UK FBA inventory. Yes, it can only really work if you have massive sales, otherwise it’s pointless. Really interested in this article as Amazon are trying to get me signed up at the moment. What would you class as massive sales? I’m really not sure whether to go ahead or not. Also, if you register for VAT in all these countries does it open up any other potential things you will be liable for in those countries? Then you can make a more informed decision whatever it’s worth selling on regional sites too. Also, don’t forget that you can sell on regional sites and fulfil orders from Amazon UK too, without registering for VAT etc. in those other countries. Lastly, if you do go ahead and register for Pan European program, I would highly recommend to use Amazon’s VAT service, where they will help with VAT numbers and VAT returns. As doing those VAT returns in every country won’t be something you can really do on your own, unless you’re an accountant by trade.